Seems like a fair market price at $110 USD. And of course, you'll need some models to play around that terrain! How about a cool shaman?! I don't even know where to start on his name, so here's a copy paste: the "Fungoid Cave-Shaman Snazzgar Stinkmullett"
And like any good goblin lord, his twice the size of a normal goblin. All for $35. Wait, what? $35? For one goblin? To make this especially funny, here's a terrible side by side I put together. And I really tried to estimate the scale correctly. Now you definitely see why the Citadel is only 3 times the cost of one goblin. Right? Yeah 35 for a goblin hero is extreme. Certainly fits with the GW idea that people will want to buy 1 so make it worth while. Even the manor thing at 110 is a lot. I could almost justify 80-90 but breaking the 100.00 point for a single building is pretty crazy. I have the old one, Skullvane Manse. It's huge. Larger than most box sets that hold 3 units or more. And tons of plastic in there. It makes sense for it to be at the top of the price scale. But yeah, over all inflation making the top $110 still feels like a lot. Back in my day, Skull Pass could be purchased for $40! New! Haha I remember the Skull Pass days! I agree on old Stinkmullet, even though it's SUPER cool model...and I really want it...but $35 is a bit too much of a stretch for me. I think they've been doing a great job otherwise providing more value for the product. The Malign Portents heroes are a stumper though. While I like the visual style of the Warscryer Skullvane Manse Citadel (it's got a vaguely Castlevania vibe to it), I've always wondered how exactly you play with something like that. There's all of about 4-5 places you could conceivably place a model: step landing, bridge, the two upper walkways, and maybe the little hut on the top with the open windows (if you don't glue the roof down and built a floor inside). 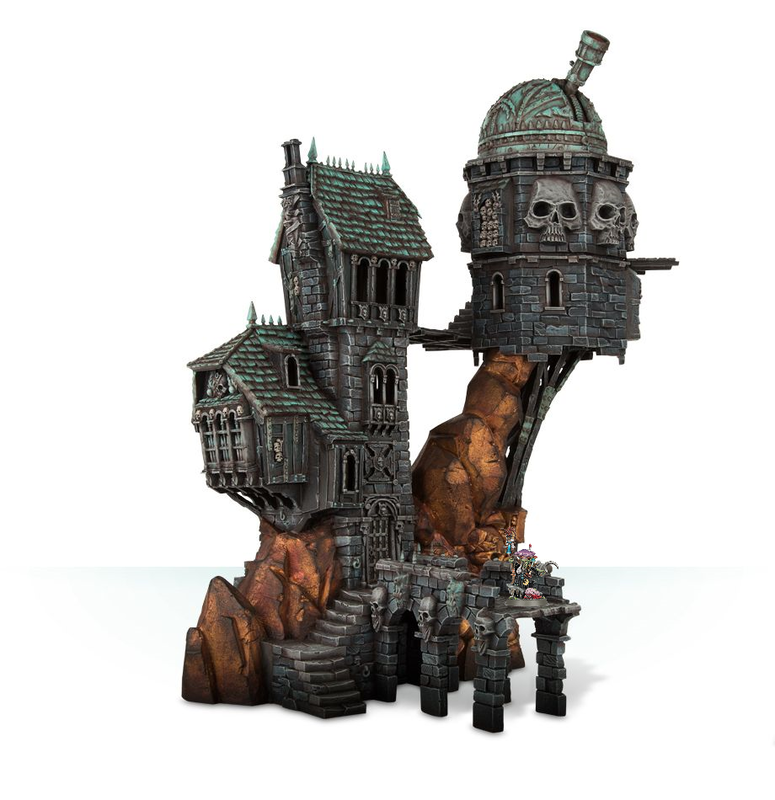 This is of course, assuming you're brave enough to put a model on top of a tall terrain piece with a hollow bottom, where you hope no heavy-handed swing of an arm sends both your model and the terrain piece flying to its untimely and explosive death. There's just not a lot of room to interact with the piece in any meaningful manner. It's a fancy LoS-blocking hunk of plastic that costs over a hundred american funbucks that you could probably build yourself out of pink foam, half a tennis ball, and an empty stick of lip balm. When you garrison a unit inside the building, it works just like Troops in a Land Raider or Rhino. You just take them off the board, or you can put them on the piece for decorative effect. If you build the platform, you can also garrison a monster. Mine is going to be converted over to a Kharadron Overlord skyport.